Nestling between Pendle Hill and the Pennine moors, Burnley was one of the major cotton towns of the Industrial Revolution but is possibly best known now as home of the plucky Premier League football team (well, till May 2015 at least) and questionable local politics. When folk say “It’s grim up North”, perhaps it’s dated murky images of the town’s rows of terraced streets, mills and chimneys that they conjure up. I can’t imagine that the Bard of Salford has ever dragged his skinny frame around the Burnley Way, but if he had it would surely change his mind. The Visit Lancashire website neatly summarises it as “A 40 mile adventure from industrial heritage, along waterways, through fields, parks, old farms and Forest of Burnley woodlands to the wild South Pennine Moors”. We split the route into two loops, using Worsthorne – conveniently located mid-way between a narrowing of the full circuit - as the start/finish point. Aptly for a Sunday morning, 22 disciples of distance walking gathered by St John’s church. It was a case of nipping along a track, through a field (which did its best to sneakily hide the path) then across stepping stones and we were into Houghton Hag Wood and on the Burnley Way proper. The day stayed fine and warm as we took in Queen Street Textile Museum in Harle Syke, followed Thursden Valley (where in quick succession we encountered the challenges of belligerent cows and an overgrown field requiring a bit of bushwacking) to loop around via Widdop and Hurstwood reservoirs before lunch amongst the midges at Shedden Clough. The next stretch on the Long Causeway provided a close-up view of one of the numerous wind farms in the landscape and ammunition for debates on the whys and wherefores of green energy. Indistinct paths above Paul Clough made me appreciate the value of a recce – I was getting stick whilst finding the right way, so heaven knows what abuse would have come my way had I got lost! Speaking of the recce, I had grim memories of the trudge from Portsmouth up to Thieveley Pike. This time it wasn’t as tough as I recalled, especially since there was the distraction of Alma explaining the benefits of her heavy breathing technique(!). All day we had enjoyed great views, and the summit panorama was fantastic: the omnipresent whaleback of Pendle, Yorkshire’s Three Peaks, the Pennine Moors and Darwen, Peel and Studley Pike towers. Not to forget Burnley, Nelson and Colne below us. Grand! The mileage was clocking up past the anticipated 22 miles and legs were getting weary, so it was good to get the last uphill pull back to Worsthorne over with. The reward, beyond the intrinsic satisfaction of completing a smashing walk – fine ale in the Crooked Billet at only £2.30 a pint! Walkers: 21, Mileage: 18.5, Weather: Overcast and Warm. 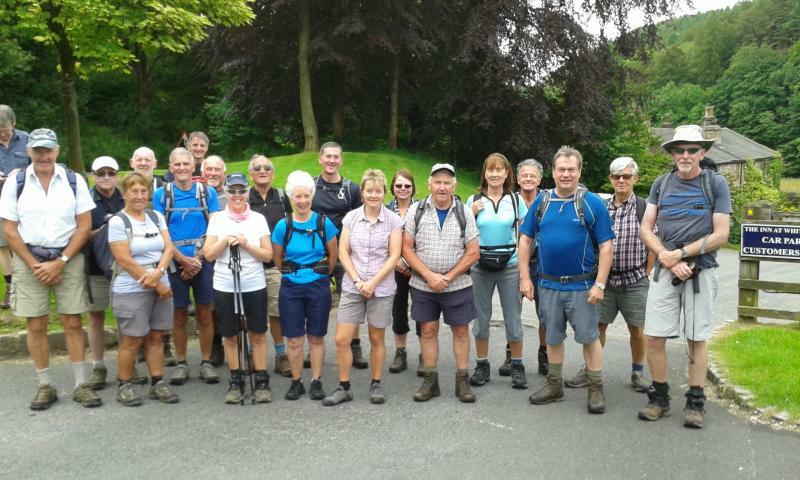 After a short coach journey from our meet place at Slaidburn, our group set off from Whitewell at 9.40. The route was uphill and tough for a few miles before descending to walk by Brownsholme Hall (which has been the home of the Parker Family for 600 years. From here the route was undulating until we reached the village of Waddington to have our lunch break in the beautiful Coronation Gardens alongside the Waddington Brook. Feeling fully refreshed we set off for our next objective which was to meet the River Ribble and walk along its bank for 2 miles to reach the outskirts of the village of Swaley. After a tough ascent we reached Hill Top Barn (where Norman used his skills as a plumber to ask at the farmhouse could we use their outside tap to refill our water bottles, they wanted some help with a computer but Norman could not oblige them here). Onwards, passing through various farms to reach Smalden Lane and after a short section on the road we went through more farms, one that would have been a good set for a Tarzan film with its overgrown footpath. We eventually reached Broadhead Farm with 1 mile to go, which was mostly uphill, but eventually we descended into Slaidburn at 5.30 to have a pleasant drink in the Hark to Bounty Hotel. At 9am on the Ides of June (Eh?) 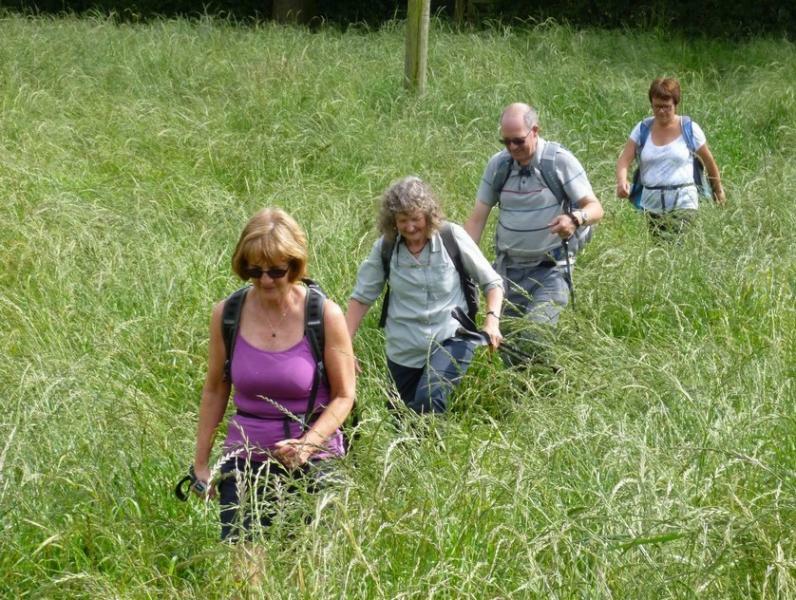 a dozen walkers gathered in the pretty Cheshire village of Mobberley – right in the heartland of East Lancs LDWA (Timperley Chapter) walking country. The Plan might have been to plod through fields and meadows and get our feet wet. If that was The Plan, the result was a success. Wet feet or not, it was a cracking walk! ‘Before’ photographs were taken against a backdrop of the Grade 1 listed St Wilfrid’s Church famous for being very old and having a window dedicated to the memory of mountaineer George Herbert Leigh Leigh-Mallory who was born in Mobberley. Off we jolly-well went, walking in a sort of south-ish direction, keeping Knutsford on our right. There was a very light mizzle in the air but we were all expecting it to brighten up considerably and so not many waterproofs were in evidence. Not yet anyway. The village cricket pitch was deserted as we passed by – many of the good folk of Mobberley were probably still in their beds. Continuing south to open country (well farmland actually) we met the first obstacles of the day: high stiles (that get higher every year) and thigh-high crops – that get higher every day. The crops had benefited from a good soaking from the previous night’s rainfall which resulted in all of our party getting wet legs. Oh well. The mizzle continued and by the time we were approaching Ollerton the whole party had donned their waterproofs. It was about this time that we met a Ramblers group walking the other way. They were shocked to find that we were intending walking 15 – 16 miles. The footpaths through Windmill Wood have been bone dry every time we’ve walked through in the past. Not today, they were muddier than a very muddy thing and those who’d escaped muddy feet so far just had to admit defeat. Or should that be defeet? Or even de muddy feet? Next landmark was Grade II listed Toft Hall, a rather grand 17th Century country house. Property developers got hold of the place a while back, spent a load of dosh doing it up and they now describe it as a ‘sumptuous 21st Century residence’. It’s certainly a bit nice. The paths around Toft Hall were quite squelchy. A mixture of cows, rainfall and badly drained ground saw to that. 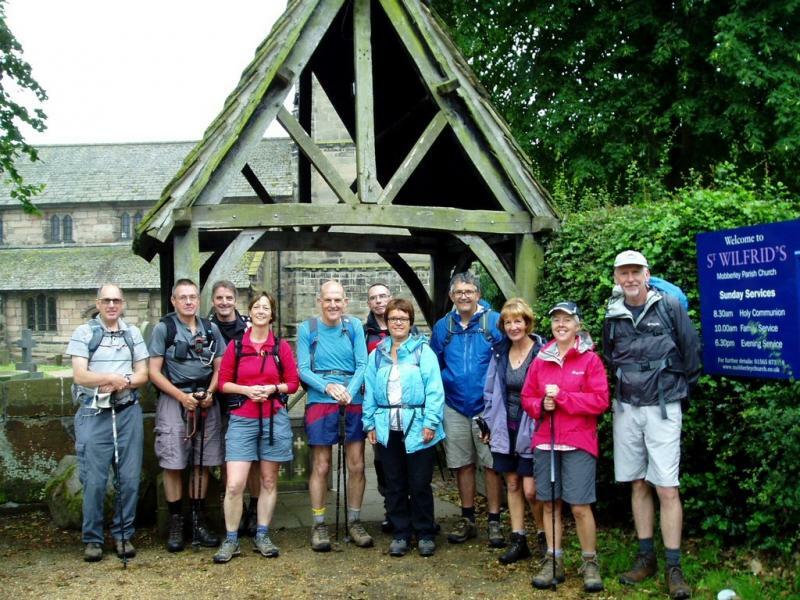 Our gallant band of walkers weren’t overly mithered about staying dry by this stage – we were all so wet and muddy it really didn’t matter any more..
Peover – pr: Peever, NOT Pee-Over. Alma. Well anyway, there’s a lot of Peovers: Peover Inferior, Peover Superior (well it IS Cheshire), Lower Peover…..you get the idea. Our route took us through Smithy Green (which is in Peover Inferior) and then into the village of Lower Peover which was designated as our lunch stop. We stopped and had lunch – fairly quietly….’cos the only shelter from the mizzle most could find was in the church’s porch. And there was a service going on. Either that or they were having choir practice. St Oswald’s church is a Grade I listed building. There’s been a church on this site since 1269 and although there’s not a right lot of the original building left these days there are certainly parts of this building that date back to 14th Century. See? Come on one of our walks and you learn something every time. Although it might not be of much use…. 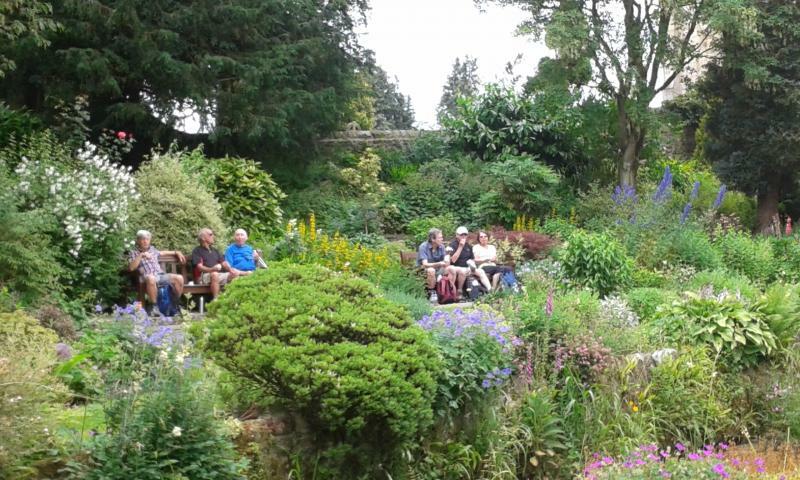 Lunch done and dusted, our next waypoint was Peover Superior and Peover Hall, a Grade 2* listed building. Whatever that means….but I’m sure it’s important. It’s a large Elizabethan family house dating from 1585 – must have been awful to be their window cleaner. The house is situated in around 500 acres of landscaped 18th Century parkland. A bugger of a job for the gardeners. Peover Hall and it’s adjacent church provided an excuse for a sit-down and another cuppa, and that’s just what we did. The mizzling had eased of considerably by this time and the sun was threatening to make its debut appearance of the day. We were now heading north, back to our starting point – although we still had a goodly few miles to cover before we could kick our soggy boots off. 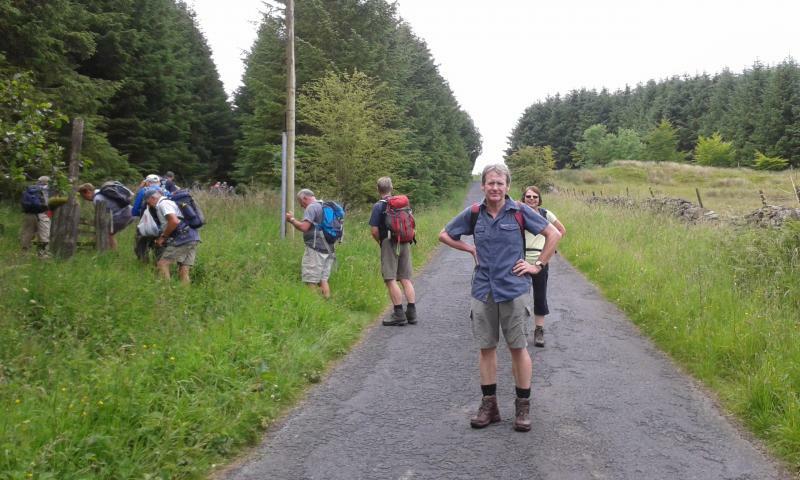 We were very fortunate to have Bob join us on this walk. Bob works locally and his lunch breaks are often spent wandering the footpaths of this area so he was able to fill in the (many!) gaps in our local knowledge. Thanks Bob! Back north we headed, across even higher stiles and the odd fetid swamp. One field we had the pleasure of crossing was populated with very frisky and inquisitive young cows. Norralot of fun for some of our party! At 4.35pm we arrived back at our cars. We’d a had a cracking day out in excellent company. Shame about the weather early on. And the mud. Oh well. 16(ish) miles with not a lot of up, but plenty of mud and wet. And good company. 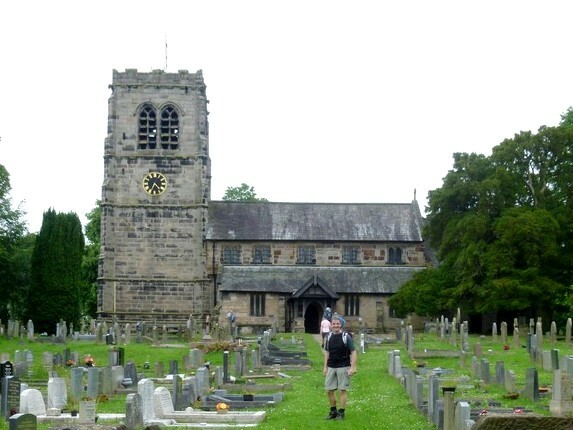 Lancashire Monastic Way, Part 6 : Grimsargh to Ribchester, Weds 11th June, 14 miles. If anyone had asked me before the day if this was a muddy walk then I would have replied in the negative. However the ferocious storms of Tuesday meant that we all came back much dirtier than we went. Leaving the Hills we retraced our steps to pass Industrial units and then bear across the fields. The route does follow the Ribble Way at this point but a dangerous bridge meant a diversion. Well, we should have diverted easily but a navigational blip meant that the chaps with the gadgets had to rescue us and find the correct path! Thanks boys. 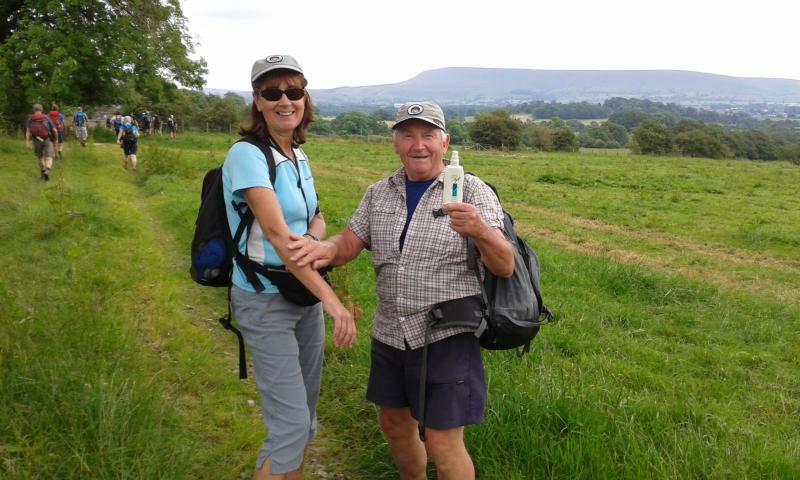 It was down and up a steep valley, over fields and then back to the Ribble Way to Ribchester. Morning coffee was taken by a renovation project and the Ribble looked lovely when we finally saw it from the bluffs above. The Church was open in Ribchester, some looked inside whilst others puzzled out what was unusual about the exterior - a question posed by Bernard. The answer is the Roman numerals on the clock are not in the usual format. Moving on we made our way north of Ribchester to have lunch at the Written Stone. Here I read out the story of the stone, daring anyone to touch it once they had heard its history. Onwards to Green Bank Park with a black swan spotted on the lake and then through the caravan site and down towards the reservoirs. We encountered the worst mud of the day near here, a plethora of slurry type stuff. Heading back to Grimsargh we crossed the busy main road several times but the idea was to avoid a dreary road walk. A final stretch along a disused railway and back to the cars with some impressive "designer" mud patterns on many legs. Thanks to all who came. The weather could not have been better with the sun shining all day for our walk on the moors. The walk started along the Rochdale canal for a mile before we started our stiff climb onto Inchfield pasture moor. We then headed west before another climb took us to the trig point at Trough Edge End. This afforded find views of the surrounding area. Making our way down a track we had a break just before the A681 Bacup Rd, here Bob & Judy reunited two lambs with their mother. Across the main road we followed the Rossendale Way through a farm with a herd Gloucester Black Spot pigs before joining the Burnley Way and following this to Thieveley Pike. Still continuing west from the Pike we then picked up the Pennine Bridleway to or lunch spot in a dell by a stream. Now at the half way point of the walk we crossed under the railway and then crossed the A646 making our way up a quiet road to the village of Mereclough where unexpectedly a farm shop was open for business. Barbara treated herself to a Blueberry Tart for tea. The Burnley Way then led us to the Cole Clough wind farm which we skirted around leading us onto the A646. Across the road a short sharp climb onto Tower Wood then along a track downwards and onto Todmorden, where either ice creams or a welcome drink were taken before our onward journey home at 4:30pm. Thanks to everybody who joined us.